In the south east of England, we suffer from hard water which as many of you have experienced can calcify on our showers leaving white limescale staining. Without fitting a water softener this limescale causes a problem around the home, particularly when the tiles are dark. 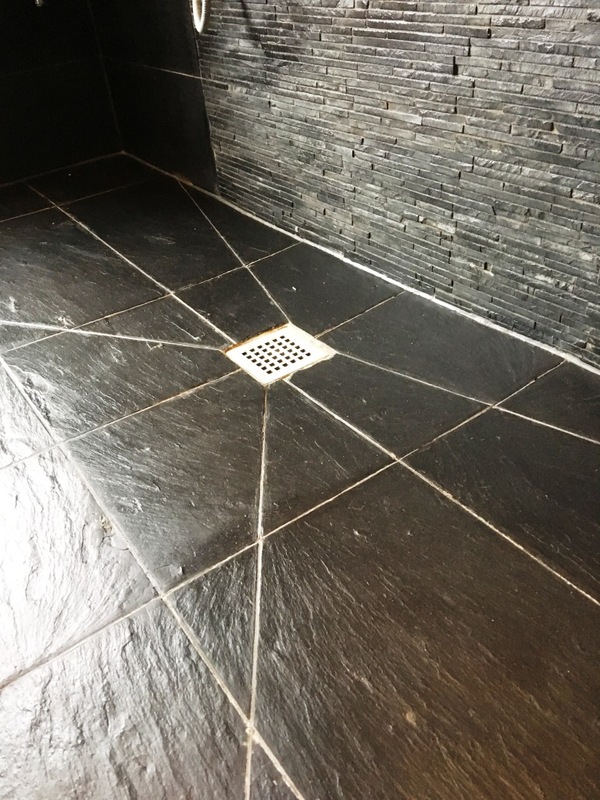 A good example of this problem was this large dark grey slate tiled shower at a house in Oxshott where the limescale had completely ruined the look of the black slate. The problem was most evident on the slate tiles on the floor but had also stained the slate split face slate tiles on the shower wall. Oxshott is a village in Surrey between Leatherhead and Esher, a survey in 2010 by the Daily Telegraph asserted it was “the village with most footballers” in England and mentioned other celebrities who chose to live in the village probably because Chelsea Football Club have their main training ground in nearby Stoke D’Abernon; It is a beautiful area and is no surprise it is also known as ‘the most expensive village in England’. The wet room was not that old, but due to the limescale staining was prematurely in need of attention. We often get calls from customers where they have use supermarket products to treat hard water stains, however these products are generally acidic, and this can make the problem worse. I would recommend you always read the back of the bottle before to check it is safe to use on natural stone before applying. After inspecting the shower, I agreed with the client the best course of action, agreed a price and booked the job in for a later date. I returned on the agreed date and started work by first removing the existing sealer by applying Tile Doctor Remove and Go which is a multi-purpose stripper that’s formulated for use on natural stone. The product also draws out ingrained stains and removes heavy grease build-up. For best results spray the product onto the tile and then leave for it to soak in and get to work breaking down the coatings etc. After ten minutes the product is scrubbed into the stone which in this case meant by hand. The soiled solution can then be rinsed off the tiles with water. The grout was then cleaned by hand scrubbing in a strong dilution of Tile Doctor Pro-Clean followed by more rinsing. The final part of preparation was to remove the limescale. This was done with a small handheld diamond block and a wire brush. The block is great for smoothing down all sorts of issues and being small it can get into tight areas. I then dried the whole room with an industrial blower. Slate cannot be sealed effectively when damp as it won’t cure properly. The blower is noisy but best in this situation and is very effective when a fast dry is needed. After lunch I checked the area was nice and dry by testing the moisture content. I then sealed the whole area, wall and floor with Tile Doctor Colour Grow. Colour Grow, is a colour intensifying sealer that provides durable surface protection as well as allowing the surface to breath and enhance colour. 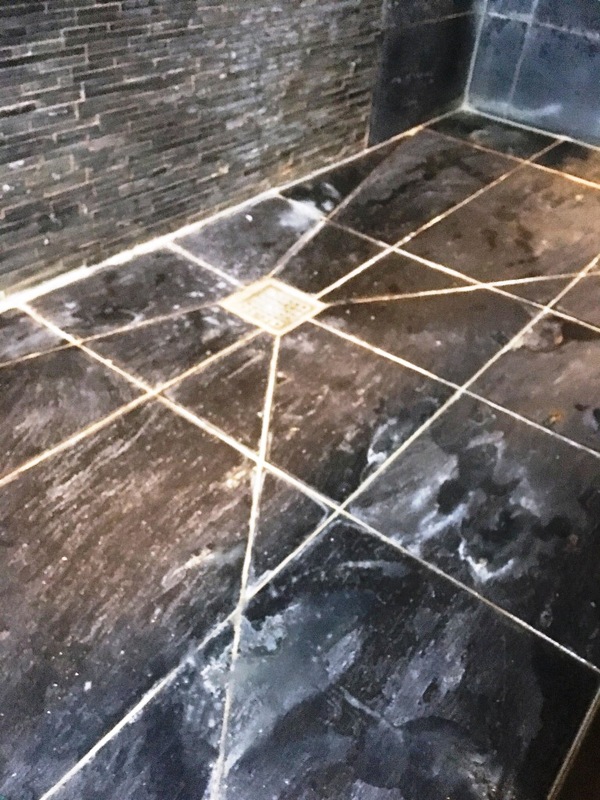 For this project it darkened the tiles nicely and will provide protection from staining, making them much easier for the client to maintain moving forward. The client was very happy with the lovely result. The bathroom looked clean and fresh again, now it is just a case of trying to keep on top of the limescale.